Image by a Korean student, inspired by Milton Glaser's Dylan poster which was inspired by Marcel Duchamp's self-portrait. 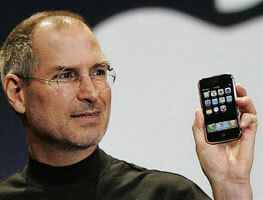 Steve Jobs died of complications from pancreatic cancer on October 5, 2011. Some of his contributions to design and the world: attention to detail, insistence on function and efficiency, creating desire, and a vision and commitment to help shape the future. What made Steve Jobs unique? Steve Jobs was not a fan of market research. He famously said "You can't just ask customers what they want then try to give that to them. By the time you get it built, they'll want something new." Instead, he relied on his own instinct for refining existing technologies, developing new products and packaging them in a way that people would want to use. Before the iPod appeared in 2001, there was relatively little interest in MP3 music players. Those products that did exist were chunky, often fiddly to use, and were largely bought by early adopter tech enthusiasts. So appealing were gadgets such as the iPod, iPhone and iPad that the public quickly engaged with them. That was due, in no small part, to Steve Jobs' ability as a salesman - explaining his products simply in a way that everyone could understand. Apple is so secretive that little is known about its internal design processes, however stories do leak out, and most of those tell of Steve Jobs' fanatical attention to detail. Google executive Vic Gundotra tells of the time that his company was partnering with Apple to put Google Maps on the iPhone. Mr. Gundotra received a personal call from Steve Jobs on a weekend, expressing displeasure that the second letter "o" was the wrong shade of yellow. While British designer Jonathan Ive is responsible for the overall look and feel of products such as the iMac, iPod and iPhone, many of the company's patents bear both his and Steve Jobs' names. Steve Jobs was undoubtedly a product of 1960s and 1970s counter-culture California. As a young man, he travelled to India to stay in an ashram. Eastern philosophy would continue to be a part of his life, and he remained a Buddhist for the rest of his life. Mr. Jobs also admitted taking LSD around the same time. He called the experience "one of the two or three most important things I have done in my life," according to John Markoff's book "What the dormouse said: How the sixties counterculture shaped the personal computer industry". Money appeared to matter little to Steve Jobs. He told the Wall Street Journal: "Being the richest man in the cemetery doesn't matter to me… Going to bed at night saying we've done something wonderful… that's what matters to me." "Design is a funny word." "Some people think design means how it looks. But of course, if you dig deeper, it's really how it works. The design of the Mac wasn't what it looked like, although that was part of it. Primarily, it was how it worked. To design something really well, you have to get it. You have to really grok what it's all about. It takes a passionate commitment to really thoroughly understand something, chew it up, not just quickly swallow it. Most people don't take the time to do that. "Creativity is just connecting things. When you ask creative people how they did something, they feel a little guilty because they didn't really do it, they just saw something. It seemed obvious to them after a while. That's because they were able to connect experiences they've had and synthesize new things. And the reason they were able to do that was that they've had more experiences or they have thought more about their experiences than other people. "For something this complicated, it's really hard to design products by focus groups. A lot of times, people don't know what they want until you show it to them." Today I want to tell you three stories from my life. That's it, no big deal, just three stories. I dropped out of Reed College after the first 6 months, but then stayed around as a drop-in for another 18 months or so before I really quit. So why did I drop out? My biological mother was a young, unwed college graduate student, and she decided to put me up for adoption. She felt very strongly that I should be adopted by college graduates. My parents, who were on a waiting list, got a call in the middle of the night asking: "We have an unexpected baby boy; do you want him?" They said: "Of course." My biological mother found out that my mother had never graduated from college and that my father had never graduated from high school. She refused to sign the final adoption papers. She only relented when my parents promised that I would someday go to college. And 17 years later I did go to college. But I naively chose a college that was expensive and all of my working-class parents' savings were being spent on my college tuition. After six months, I couldn't see the value in it. I had no idea what I wanted to do with my life and no idea how college was going to help me figure it out. And here I was spending all of the money my parents had saved their entire life. So I decided to drop out and trust that it would all work out OK. It was pretty scary at the time, but looking back it was one of the best decisions I ever made. I could stop taking the required classes that didn't interest me, and begin dropping in on the ones that looked interesting. I didn't have a dorm room, so I slept on the floor in friends' rooms, I returned coke bottles for the 5¢ deposits to buy food with, and I would walk the 7 miles across town every Sunday night to get one good meal a week at the Hare Krishna temple. I loved it. And much of what I stumbled into by following my curiosity and intuition turned out to be priceless later on. One example: Reed College at that time offered perhaps the best calligraphy instruction in the country. Throughout the campus every poster, every label on every drawer, was beautiful hand calligraphy. I decided to take a calligraphy class. I learned about serif and sans serif typefaces, about varying the amount of space between different letter combinations, about what makes great typography great. It was beautiful, historical, and artistically subtle in a way that science can't capture; and I found it fascinating. None of this had even a hope of any practical application in my life. But ten years later, when we were designing the first Macintosh computer, it all came back to me. And we designed it all into the Mac. It was the first computer with beautiful typography. If I had never dropped in on that single course in college, the Mac would have never had multiple typefaces or proportionally spaced fonts. If I had never dropped out, I would have never dropped in on this calligraphy class, and personal computers might not have the wonderful typography that they do. Of course it was impossible to connect the dots looking forward when I was in college. But it was very, very clear looking backwards ten years later. Again, you can't connect the dots looking forward; you can only connect them looking backwards. So you have to trust that the dots will somehow connect in your future. You have to trust in something - your gut, destiny, life, karma, whatever. This approach has never let me down. I was lucky – I found what I loved to do early in life. 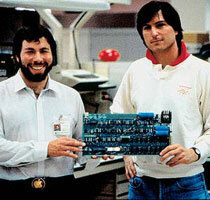 Steve Wozniak and I started Apple Computer in my parents' garage when I was 20. We worked hard, and in 10 years Apple had grown from just the two of us in a garage into a $2 billion company with over 4,000 employees. 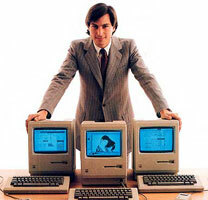 We had just released our finest creation - the Macintosh - a year earlier, and I had just turned 30. And then I got fired. As Apple grew we hired someone who I thought was very talented to run the company with me, and for the first year or so things went well. But then our visions of the future began to diverge and eventually we had a falling out. When we did, our Board of Directors sided with him. So at 30 I was out. What had been the focus of my entire adult life was gone, and it was devastating. I really didn't know what to do for a few months, but something slowly began to dawn on me - I still loved what I did. I had been rejected at Apple, but I was still in love. And so I decided to start over. It turned out that getting fired from Apple was the best thing that could have ever happened to me. The heaviness of being successful was replaced by the lightness of being a beginner again, less sure about everything. It freed me to enter one of the most creative periods of my life. During the next five years, I started a company named NeXT and another company named Pixar. Pixar went on to create the worlds first computer animated feature film, Toy Story, and is now a very successful animation studio. In a remarkable turn of events, Apple bought NeXT, I returned to Apple, and the technology we developed at NeXT is at the heart of Apple's current renaissance. I'm pretty sure none of this would have happened if I hadn't been fired from Apple. It was awful tasting medicine, but I guess the patient needed it. Sometimes life hits you in the head with a brick. Don't lose faith. I'm convinced that the only thing that kept me going was that I loved what I did. You've got to find what you love. Your work is going to fill a large part of your life, and the only way to be truly satisfied is to do what you believe is great work. And the only way to do great work is to love what you do. If you haven't found it yet, keep looking until you find it. Don't settle. When I was 17, I read a quote that went something like: "If you live each day as if it was your last, someday you'll most certainly be right." It made an impression on me, and since then, I have looked in the mirror every morning and asked myself: "If today were the last day of my life, would I want to do what I am about to do today?" And whenever the answer has been "No" for too many days in a row, I know I need to change something. Remembering that I'll be dead soon is the most important tool I've ever encountered to help me make the big choices in life. Because almost everything - all external expectations, all pride, all fear of embarrassment or failure - these things just fall away in the face of death, leaving only what is truly important. Remembering that you are going to die is the best way I know to avoid the trap of thinking you have something to lose. There is no reason not to follow your heart. About a year ago I was diagnosed with a tumor on my pancreas. I didn't even know what a pancreas was. The doctors told me this was almost certainly a type of cancer that is incurable, and that I should expect to live no longer than three to six months. My doctor advised me to go home and get my affairs in order, which is doctor's code for prepare to die - prepare to say your goodbyes. I lived with that diagnosis all day. Later that evening I had a biopsy, where they stuck an endoscope down my throat, through my stomach and into my intestines, put a needle into my pancreas and got a few cells from the tumor. I was sedated, but my wife, who was there, told me that when they viewed the cells under a microscope the doctors started crying because it turned out to be a very rare form of pancreatic cancer that is curable with surgery. I had the surgery and I'm fine now. This was the closest I've been to facing death. Having lived through it, I can now say this to you with a bit more certainty than when death was a useful but purely intellectual concept: No one wants to die. Even people who want to go to heaven don't want to die to get there. And yet death is the destination we all share. No one has ever escaped it. And that is as it should be, because Death is very likely the single best invention of Life. It is Life's change agent. It clears out the old to make way for the new. Right now the new is you, but someday not too long from now, you will gradually become the old and be cleared away. Sorry to be so dramatic, but its quite true. Your time is limited, so don't waste it living someone else's life. Don't be trapped by dogma - which is living with the results of other people's thinking. Don't let the noise of other's opinions drown out your own inner voice. And most important, have the courage to follow your heart and intuition. They somehow already know what you truly want to become. Everything else is secondary. There was an amazing publication called The Whole Earth Catalog, which was one of the bibles of my generation. This was in the late 1960's, before personal computers and desktop publishing, so it was all made with typewriters, scissors, and polaroid cameras. It was sort of like Google in paperback form, 35 years before Google came along: it was idealistic, and overflowing with neat tools and great notions. When The Whole Earth Catalog had run its course, they put out a final issue. It was the mid-1970s, and I was your age. On the back cover of that final issue was a photograph of an early morning country road, the kind you might find yourself hitchhiking on if you were so adventurous. Beneath it were the words: "Stay Hungry. Stay Foolish." It was their farewell message as they signed off - Stay Hungry. Stay Foolish. And I have always wished that for myself. And now, as you graduate to begin anew, I wish that for you.